We’re on chapter 8 as the audiobook comes out week by week on |iTunes as a podcast|. If you want to hear this audiobook don’t wait to download it. Mur Lafferty’s agreement with the publisher is that she can only leave the audio files up for a week after she finishes all the chapters on the podcast. So get it while the getting is good. So far I am enjoying this a lot. 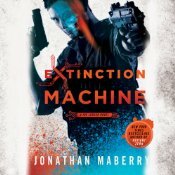 It is not another of those “the world is covered with zombies and we’re all just trying to survive” books. The supernatural world is existing camouflaged alongside ours, as we can anticipate from watching our heroine try to get a job writing travel guides. I enjoyed Lafferty’s Playing for Keeps as a light take on superhero adventures, which were all the craze at the time. Shambling Guide seems like a similar take on the current zombie craze in literature so I look forward to seeing what sort of adventure tale is spun. So far, this seems like a light, fun read that I would give to my mother or sister (who do not delve as deeply as I do into urban fantasy). And, depending on where the story goes, I might even pick up the print copy for my own shelves. The book is available on on Audible, too. Girls like her, my grandfather once warned me, girls like her turn into women with eyes like bullet holes and mouths made of knives. They are always restless. They are always hungry. They are bad news. They will drink you down like a shot of whisky. Falling in love with them is like falling down a flight of stairs. What no one told me, with all those warnings, is that even after you’ve fallen, even after you know how painful it is, you’d still get in line to do it again. That’s Cassel Sharpe for you. He’s stuck on Lila Zacharov and stuck good. It’s a real shame that he’s under duress to work undercover for the FBI and she’s enthusiastically training to take a place in her father’s crime family. If only that were his only problem. As in the previous two books of the Curse Workers trilogy, where certain individuals are born with the ability to curse others with the touch of a finger, we’re working up to a big con job that will save the day. Meanwhile Cassel is continually attempting to become a better person, a good person, while navigating a gritty maze of gray moral choices. He’s given plenty of opportunities because his special curse working skill means that everyone wants to use him. Sorting through lures, threats, and blackmail from family, the mob, and the government becomes a way of life and gives author Holly Black plenty of room to weave plots. Cassel’s mother is held hostage, a long-ago diamond heist must be solved, a fellow student needs help against a blackmailer, the government needs him for a special mission that could end bigotry against curse workers, and his roommate has girl friend problems. And let’s not forget the main attraction, Cassel’s tumultuous relationship with Lila, who now hates him. Yep. It’s all in a day’s work for Cassel Sharpe. As always, it comes down to an elaborate con which pulls everything together and wraps things up, while managing to stay plausible. 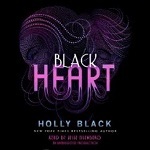 Black has the courage to bring her trilogy to a definite end and I applaud her for doing so. The ending is not tidy, but I liked it that way. It managed to be satisfying while simultaneously reflecting the uncertainty of Cassel’s life. And that is quite a feat. 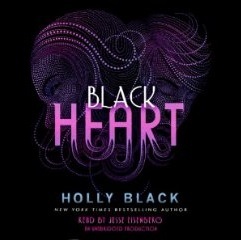 Interestingly, this last book of the trilogy contained a spot where author Holly Black suddenly took a misstep in writing from a male perspective. In a love scene a guy would not be talking about his flat stomach and corded muscles … that’s a girl’s turn on. He’d be talking about her … ahem … various attributes. Black did such a good job the rest to of the time that this rang particularly false and it isn’t a big deal. Just … interesting. Audio Notes: As with the preceding Curse Worker books, Jesse Eisenberg’s narration is perfect for conveying Cassel’s awkwardness. I particularly enjoy the moments when he portrays other characters through slight alterations which manage to communicate a surprising amount about the people he is voicing. His narration is a big part of my enjoyment of the series. Would I read other Curse Worker books instead of listening to the audio? Probably not. Eisenberg is Cassel and I like it that way. Radar expert and electronic engineer Terry Holt has been recruited by a scientific expedition in the Phillipines to make underwater listening devices. They won’t tell him what his inventions are meant to investigate. And that makes him mad. He has some ideas though. Orejas de ellos, the things who listen, have been the explanation by fishermen about strange catches of fish. Are they real or just superstition? What are the mysterious shooting stars that seem to fall with such frequency into the Luzon Deep? Why do mysterious swarms of fish gather in one specific area of the ocean? Had Leinster been reading Jules Verne? Had he been reading H.G. Wells? Or is this a completely new creation? Those are the questions I repeatedly asked as I vacillated between three different theories about the mysterious “fish herding” and who is doing it. As Leinster always does, I was glued to this adventure story investigating what comes from the abyss, which may be deadly, especially to those who are set on discovering the truth. I will disclose only this … I was very surprised by the end of the story. Bravo, Murray Leinster. I listened to the LibriVox free audio version, narrated by the wonderful Mark Douglas Nelson. Jed Cochrane is about to take off on man’s first interstellar voyage. His mission: Make sure it’s good television! Prompted by my enjoyment of the Murray Leinster Collection, I went searching for another likely Leinster book to try. 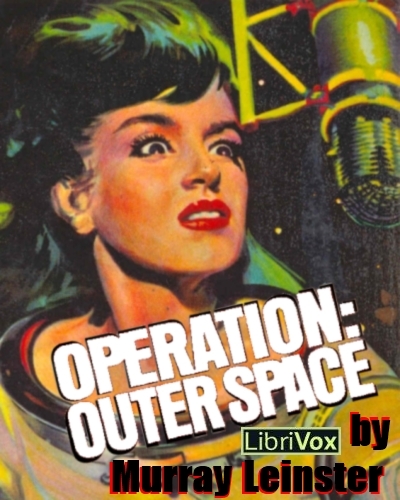 I vaguely recalled Mark Douglas Nelson running Operation: Outer Space at SciPodCast before it went to live at LibriVox. As someone who works in advertising I found much to enjoy in Murray Leinster’s tale of an unlikely space expedition financed by television show sponsors. I also appreciated the fact that Jed Cochrane has a loftier ambition fueled by his own unhappiness at the overcrowding on Earth and lack of hope among the population. He is pursuing a solution the only way that he has been trained to do, through business opportunity. In this way the book is also a left-handed compliment to capitalism, albeit tongue-in-cheek. Mark Douglas Nelson’s narration, as always, is spot on. I always enjoy his reading and he lets the story shine through. Space Casey is a 10-part audiodrama miniseries which won the Gold Mark Time Award for Best Science Fiction Audio Production by the American Society for Science Fiction Audio and the 2008 Parsec Award for Best Science Fiction Audio Drama. Pure nostalgia took me back to this really fun little audio drama. Listening to Mur Lafferty read The Shambling Guide to New York City made me recall the other Podiobooks I discovered with such pleasure. The story follows con artist Casey as she boosts a spaceship from a greenhorn. Problem is, the spaceship was programmed to take off for uncharted territories. Uncharted to humans that is. I won’t say more about the plot other than we see Casey rise to new heights as she struggles to return to human space with all the odds against her. Never was her ability to con people (and aliens and robots and spaceships) more necessary for her survival. This is a lot of fun and I found myself laughing aloud several times. I absolutely love Christiana Ellis’s sense of humor and narration. She also got a lot of voice talent assistance from other well-known Podiobooks and podcasting talent. I had fun seeing if I could identify them before the credits at the end. Perfect summer fun, or actually fun for whenever you’re listening.